Today, the GCRFEV team members on behalf of Dao Trang Phap Hoa, USA and its branch in Bodhgaya, Dharma Lotus Meditation Center Trust went to Thakani -8 VDC at Sindhupalchowk. The Thakani village in Sindhupalchowk is gracefully perched on the plain of the steep mountain accessible only through hours of toilsome trekking. But amazingly enough, due to the praiseworthy driving skill of Mr. Padam, the veteran relief worker himself, we reached the top where the relief program was held. Mr. Padam contributed immensely to the successful conduct of the Program. 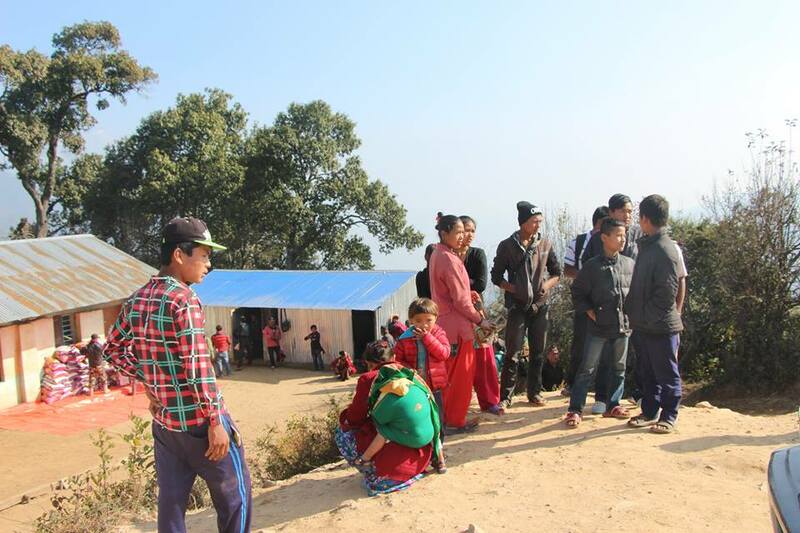 The program venue is a lower secondary school at Thakani, Sindhupalchowk where GCRFEV distributed caps, jackets, trousers, exercise copies, pencils, erasors each to 125 students studying in that school named Sri Thana Bhanjyang Lower Secondary School. There are 8 teachers teaching in that school, all of whom were offered by the GCRFEV, the notebooks and pens. There are 205 families in the village who got the same number of rice sacks, one sack for each family. 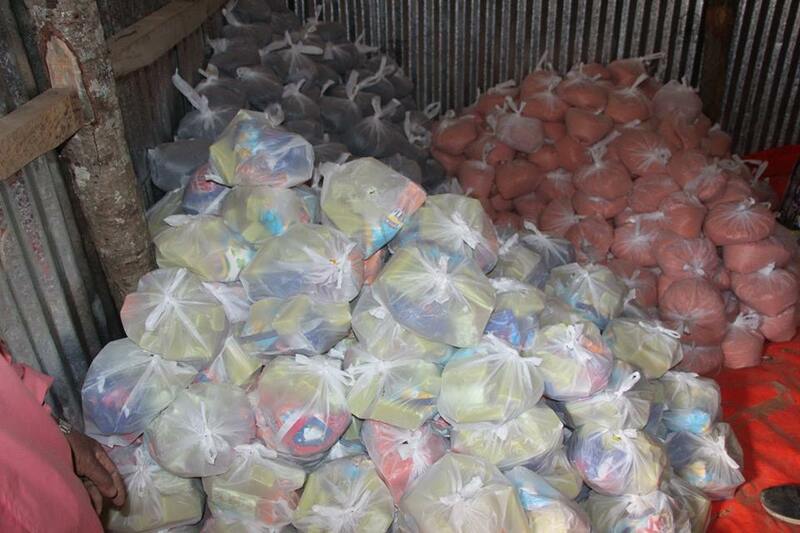 They also got the same numbers of tea packets, Kgs of lentils, soaps, sugar, salt etc. Even when we entered the district of Sindhupalchowk by the four wheeler Landcruiser, we saw not a single unscathed house left there. Sindhupalchowk is a ill-fated place, where the major earthquake occured on 26th April, 2015 followed by the most number of aftershocks in that very area. So not a single home is left, all destroyed. Most of them fled to Kathmandu valley, but as the life have come back to normalcy, they have started returning to their homeland. The school where we conducted the relief program is also miserably temporary shelter made of zinch sheets. The school building which used to be there before earthquake entirely collapsed and the place is now empty land. There the students can study with tremendous hardship only upto grade seven. So far no attention from either government or any relief team has been drawn to that area before GCRFEV’s effort. So they desperately need a strong permanent school where the children can study comfortably. With the advent of winter season, the harsh cold is also unbearably increasing and those young kids have been so mercifully shivering with cold without the warm clothing. The life there is really very difficult in the aftermath of earthquake and aftershocks. On the top of that, the scarcity of fuel has aggravated the already dire situation of the inhabitants impoverished villagers of Sindhupalchowk. It is to be remembered that more than 3000 people, the highest number of people, died in Sindhupalchowk due to the earthquake. Sincere thanks must be given to Mr. Brajesh Kumar who represent Dharma Lotus Meditation Centre from Bodhgaya, India who equally contributed a lot to the success of this relief program by GCRFEV.